“knitty kitty” . . . Okay, so maybe I overdid it. I started knitting a sweater for M. on Tuesday, this week. 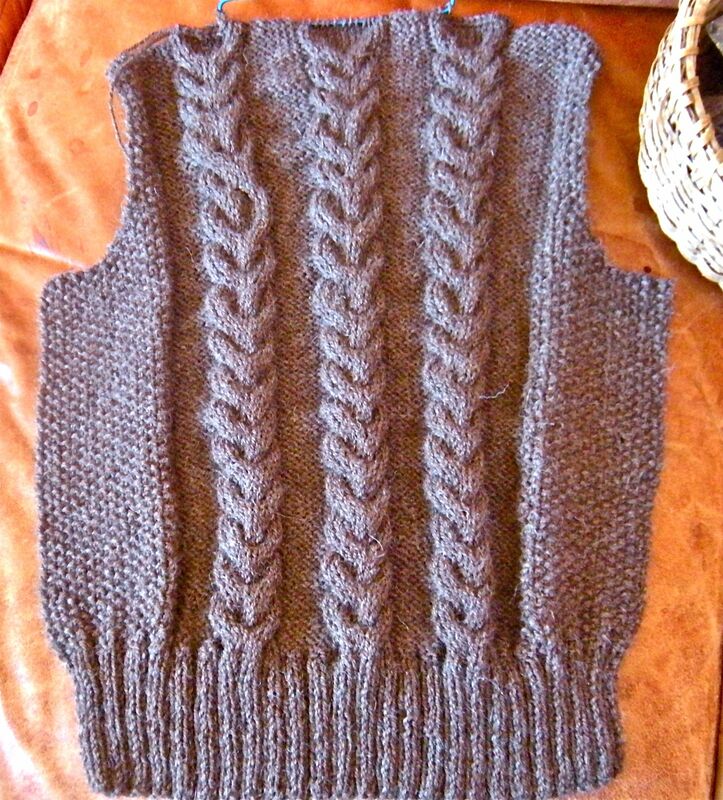 I started the back on size 4 needles for the ribbing and size 6 for the body of the sweater. I noticed that the knitting was rather stiff, the gauge being a little tight. So I started over after trying out size 8 needles for the main part of the sweater. Once I had the new gauge, I recalculated the stitches needed for the pattern of seed stitch, purl and staghorn cable. The larger needles gave the knitting more drape and felt softer. Perfect! I knitted up the back to the armholes, skype-ing with M. to make sure we had accurate body measurements: edge to bottom of the armhole, armhole to shoulder, shoulder to wrist. She wants the sweater ribbing to hug at the waist rather than having an overly large fit. Last night, while watching a couple of TV shows, I cast off at the shoulder line, which finishes the back. I cast on fifty stitches to start the left front of the sweater. This morning, I woke up with a sore right shoulder. I had also noticed a slight “click” in my shoulder when I rotated my arm, which became apparent when two-thirds of the back was finished. So this afternoon, I’m headed out to my chiropractor for some treatment to the shoulder and general straightening of my spine. I haven’t been there in awhile since I was doing shiatsu, but this is a good time to get back to realigning everything again. M. wrote to me that “Knitty Kitty” ~ the name of a children’s book that she reads to Josie ~ needs to take a break. I guess you could say she’s right about that. Smile…now, you do understand that other than the word “knit” “sweater” and “kitty” I have no idea what you are talking about? Hope all goes well on the shoulder! Haha! My chiropractor said I had a shoulder “spaz” and did ultrasound on it, told me to ice it with an ice pack and not from a bag of frozen peas, and take Advil liquid gels– and not to knit until next week! So am spending the day packing and storing all the Christmas things (finally!) What are you up to for the weekend? Working on writing some things–have to be off the knee again this weekend…sigh. Did you fly with a swollen knee? Hope things subside in a good way on all fronts! Just finished stacking the Christmas things in the closet so it’ll be easier next year: the new Christmas tree stand and box of lites are beside the box containing the angel that goes on top! One, Two and Three when setting up the tree next year! VOILA! Hey, I am happy to have had a reasonably sane Christmas this year–can’t even think about next year! No flying–I was grounded again. But, I do hope to get up my Mardi Gras tree shortly!